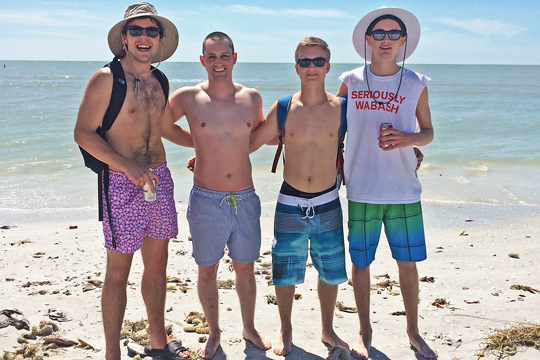 “On a spring break trip down to Sanibel Island, FL, this past week, I stumbled upon 3 students from the class of 2019! These 3 and a dozen of their friends were waking the beach when I looked up and had a “are you guys from Wabash? ?” moment. The old and the new…both timeless in their own way. Took this photo right before President Hess’ Chapel talk. I was struck by the symbolism of the old and new Sphinx Club pledge pots side by side. One denotes a proud past….who are the guys who have worn that particular pot? One denotes a newness…crafted upon tradition. Who will wear that pot? Which one of your sons or grandsons will don that one? We do some things the same way we have always done them…because we believe that’s best. We continually refine other things because we’re in the pursuit of perfection. How do we tell the difference? Honestly, I don’t know. 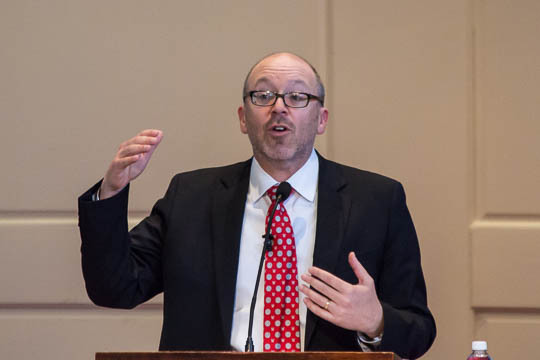 But I do know that Chapel Sing remains a cornerstone of Wabash and having the absolute best textbooks, teachers, and labs is also a cornerstone of Wabash. And all of that makes this poor, dumb fighter pilot’s head spin! 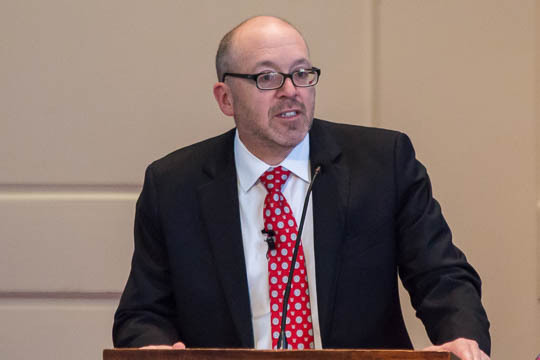 President Hess spoke in Chapel yesterday morning. A lot of sage advice for our young men. I don’t want to keep you from watching his talk on You Tube but I thought I’d offer a part of the “executive summary”. “Set your expectations high…and work hard.” That works for college…and also for 99.9% of everything life will throw at you. At the end of the day, if our guys have done those two things…they WILL change the world…and feel good about their lives. 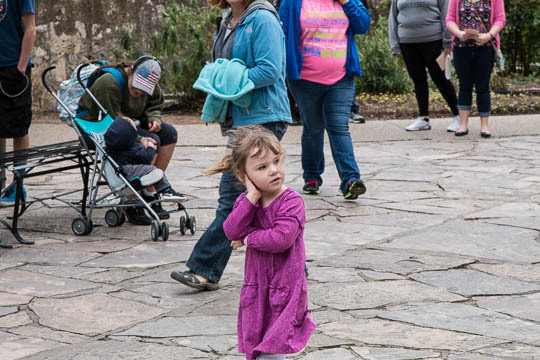 As the Glee Club was singing at the Alamo over spring break, I just happened to catch this young lady walking by and listening to our guys. Collin Luckey will be attending our Alma Mater in the fall. 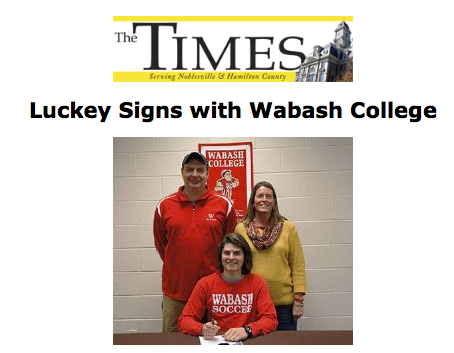 Collin joins the Wabash Class of 2019! Yes, it runs in the family. Dad Andy is a 1993 graduate, a Phi Psi history major. Collin isn’t sure what he’ll study – perfect for starting at a liberal arts college. Collin is a soccer player and we’re sure he’ll be a contributor. 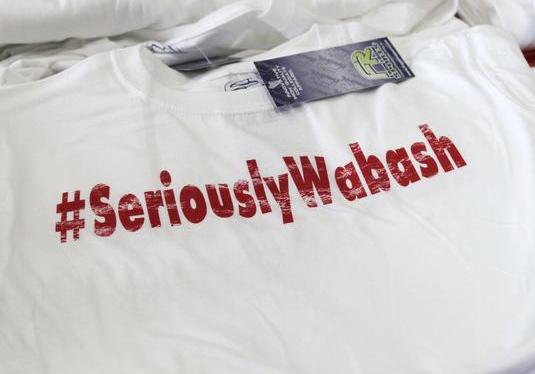 To read more about Collin and his choice of Wabash, click here. 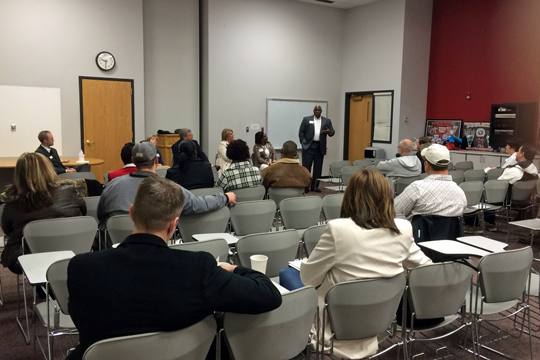 The Parents Panels at Honors are always good sessions – and this morning’s sessions were no different. Parents included Beth Bell, Jim and Susan Dyer, and Hank and Patsy Webber-Hunt. 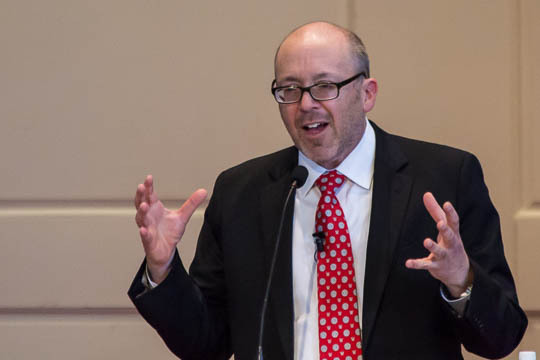 Beth captured the essence of Wabash in a single word – “transformative.” Beth stated that she works with a Wabash alumnus who credits Wabash with giving him the skills to become a legal expert AND scholar. Beth sees the same thing happening to her son, a sophomore here. Patsy added another perspective. She stated that Wabash students are a group of winners. And winners, she went on, encourage others to win. Honor Scholarship Weekend Is Here! 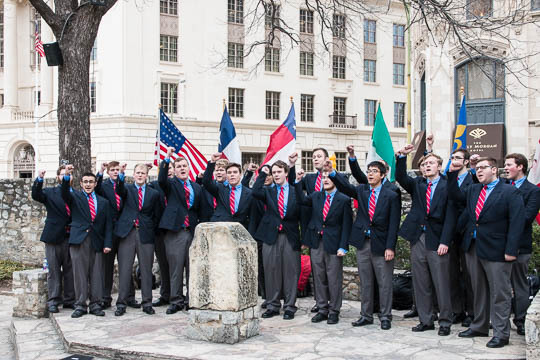 Over 300 young men, many with parents, will descend on the campus…starting today. In fact, several guys are already taking some tests on this Thursday morning. The population on campus goes up by about 34% at Honors…that influx really brings the campus alive. Wabash isn’t for everyone…but we certainly hope it fits what a majority of these young men want in a life-changing educational experience! 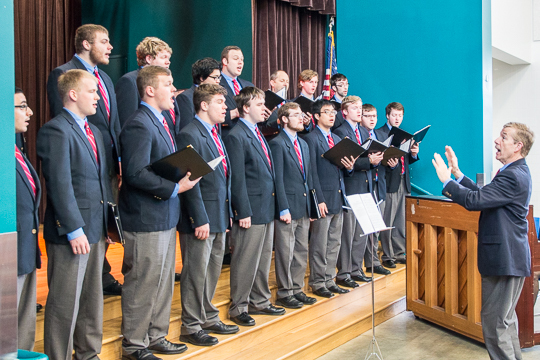 Last week the Glee Club started off several of their concerts with the National Anthem. To the Grunge, it always fits, no matter the venue or assembled group. At the UT Elementary School (a charter school), the kids loved it. I caught s glimpse out of the corner of my eye at one young lady in particular. 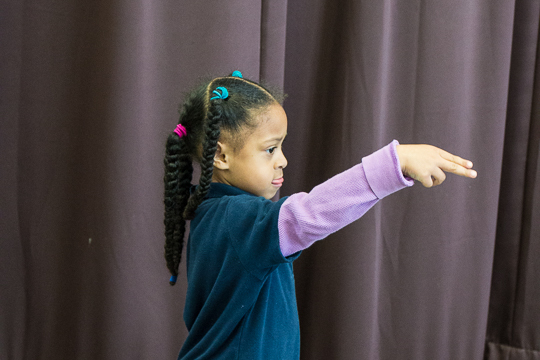 As soon as the Glee Club started singing, she rose to her feet and stood at attention. Then several times throughout, she would salute. There’s a part of me that wondered if a parent or parents were/are in the Service. I didn’t ask and it would not have mattered. What matters, I think, is that she understood the importance of the Anthem in her own, very special, way. It reminds me that patriotism is always in style and also the tremendous impact our guys have on others when they are out and about. I saw it often as the Glee Club traveled from the Alamo to Vista Ridge High School to the retirement community at Longhorn Village. 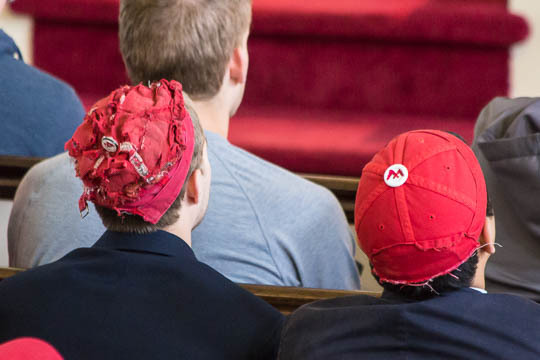 These guys are the face of Wabash! 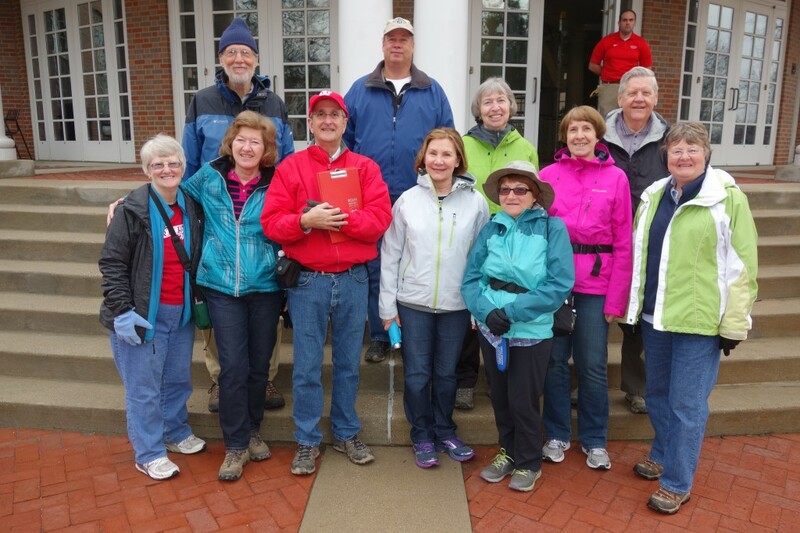 This past Saturday at the end of spring break I held an Indianapolis Hiking Club hike at Wabash College. Attached is a picture of our group in front of the Trippett Center. It was an unexpurgated tour with comments about fraternity hijinks, the senior bench, compulsory chapel, the fabulous Trippet story of the young Abe Lincoln statue with parts of the dog painted scarlet, etc. No sons and grandsons wanting to go to Wabash, but there were two interested grand-daughters. There was one question about the college restricting it’s admission to men only: “Is this legal?” We dined at the Creekside Lounge and hiked the Sugar Creek Trail in the afternoon. Eileen Bowen – What a Resource! By day, Eileen Bowen has four hats to wear…no…make that five. She serves as the Administrative Assistant for departments in the Fine Arts Center as well as running the Wabash Fine Arts ticket office. 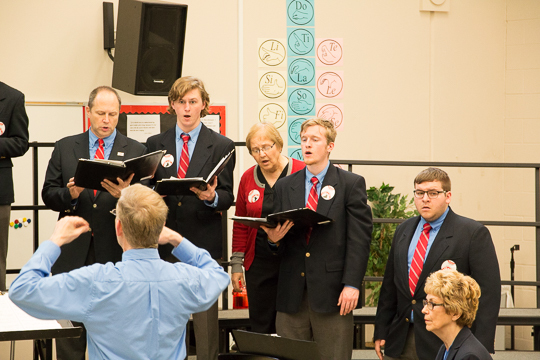 When the Glee Club goes on tour, she accompanies Richard, her husband, and the guys. She serves as the official Glee Club camera person as well. I saw a new piece to the “accompanies” part on the latest tour. While warming up at the Vista Ridge High School, Richard needed an “E flat”, I believe. So he pressed Eileen into service. She provided an “E flat” and the tune went without a hitch. I don’t know an “E flat” from a bass guitar, but Richard…and Eileen…certainly do. They are a good team…in many ways.